iFonebox is outstanding iOS data recovery software that can recover iPhone, iPad or iPod Touch lost data. 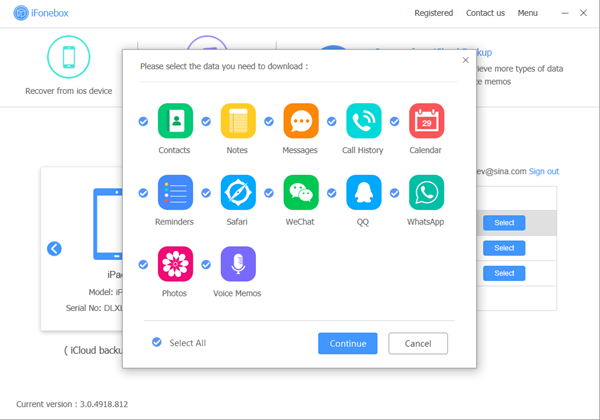 It is capable of recovering deleted or lost Contacts, Notes, Messages, WhatsApp, Call History, Calendar, Reminders, Safari, WeChat Contacts, WeChat Messages, Photos, Voice Memos, Message Attachments, WhatsApp Attachments and WeChat Attachments etc. iFonebox allows users to recover data not only from iPhone, iPad or iPod Touch but also from iTunes or iCloud backup file. It is fully compatible with the latest iOS 11 and supports the latest iPhone 7s , iPhone 7s Plus and iPhone 8.
iFonebox is specialized iPhone, iPad and iPod Touch Data recovery software. It can recover deleted or lost data selectively from iDevice as well as from iCloud and iTunes backup file. 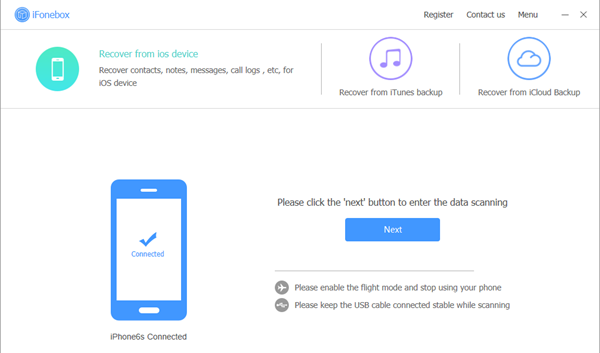 With iFonebox, recovering lost data is not a decision of all-or-nothing anymore, you can select whatever you need to recover. And the recovering is as easy as a few clicks. Choose to recover from iDevice or from iTunes or iCloud backup according to how you have lost or deleted your data. If you choose to recover from iDevice, please make sure your iPhone, iPad or iPod Touch is accessible. 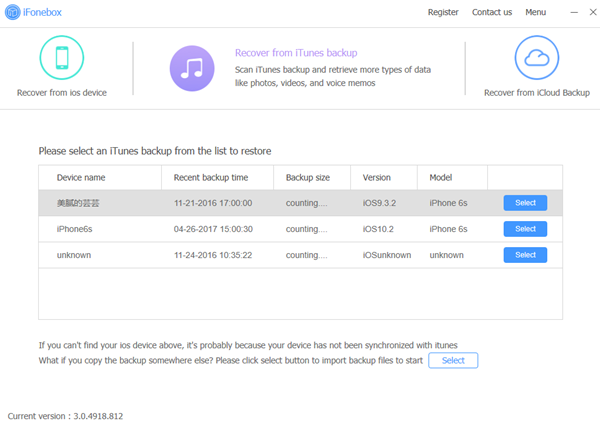 If you choose to recover from iTunes or iCloud backup, please make sure the backup file does contains the data you want. From the interface listing all the supported data categories, choose one which you want to recover by simply clicking on the relevant icon. If you want to export data of all the supported categories, hit the top right button “Recover All”. The data scanning and analyzing may be time consuming. Please wait for a while with patience. After the scanning process completes, take a preview at the exported items and choose what you need to recover to computer or device. You can download the trial version of iFonebox at the home page, the product page or even every guide post page. The installation package is tested to be virus free. Please feel free to download to your computer. Click to open the folder where the installation package is saved. Double click on the setup file named ifonebox_install.exe to start the installation by following the onscreen instructions of setup wizard. A window will pop up after the double click and requires of accepting the agreement and confirming to install by hitting the button of “Install Now”. The installation will take some time, please wait for a while. 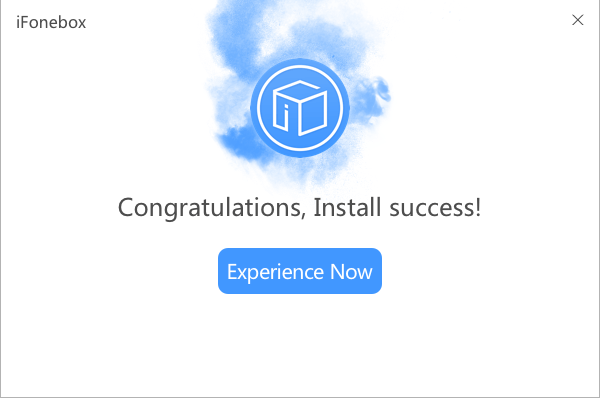 Hit the button of “Experience Now” to start up iFonebox after the installation process finishes. 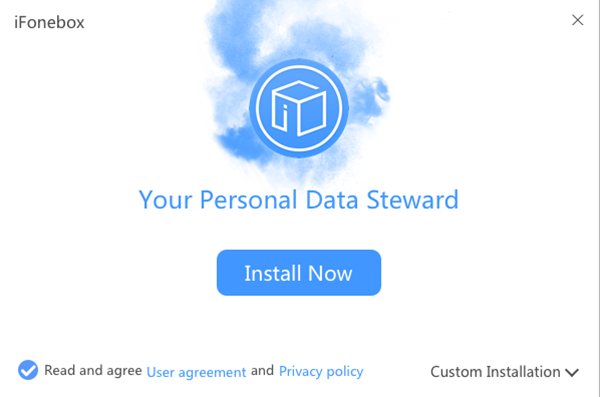 As the version you have free downloaded and installed is a trial version, you can have a try at first to see whether iFonebox can find your lost or deleted data and then decide whether to pay for the full version. You can click the Help tab at the upper right and choose to “Purchase” to acquire the registration code. And then Choose “Register” and then enter the registration code as required to complete the registration. You can click on the Help tab which is located in the upper right part to tap on the option of “Check for Update” to check whether there is update available to download. Also, when there is an update available, a window will pop up to inform you about the update when you launch iFonebox. From the pop-up, you can choose to download the latest version of iFonebox. Uninstalling iFonebox is much easier than installation. Click the “Start” button at the bottom left of your computer > choose “Control Panel” > Program> click on “Uninstall a program”. Locate iFonebox and right-click it. In the pull-down menu, click “Uninstall” and follow the instruction to uninstall iFonebox from your computer. iFonebox recovers deleted text data including Contacts, Notes, Messages, WhatsApp, Call History, Calendar, Reminders, Safari, WeChat Contacts, and WeChat Messages etc and exports existing data such as Photos, Voice Memos, Notes Attachments, Message Attachments, WhatsApp Attachments and WeChat Attachments directly from iPhone 7 Plus/7/SE/6s Plus/6s/6/6Plus/5S/5C/5/4S/4/3GS, iPad Air, iPad mini 2 (Retina), iPad mini, iPad with Retina display, The new iPad, iPad 2/1. Install and run the full version of iFonebox. Connect iPhone, iPad or iPod Touch to computer. Click “Start” access the data interface after your device is detected. Tips: If you use an iPhone 4/3GS, iPad 1 or iPod Touch 4, you can also start the scanning of your device by clicking on the “Advanced mode” button. 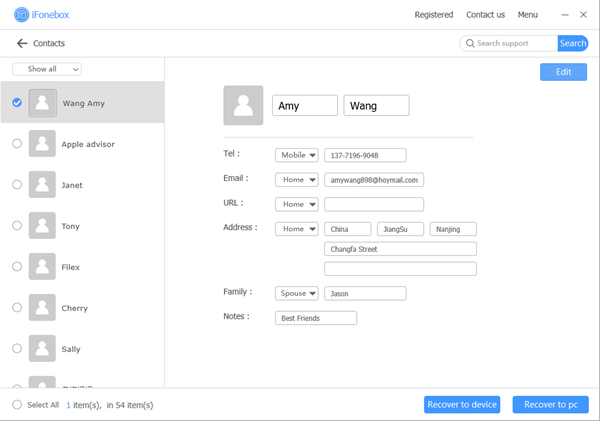 All the data categories supported by iFonebox are displayed in the interface. Just click on the icon of the data you want to recover and iFonebox will automatically start the scanning and analyzing. After the scanning completes, you can preview the items of exported data, including the deleted items. Select what you want and transfer them to your computer by clicking on the “Recover to PC” button. If you want to preview or recover other data, just click the “Close” button to exit the current interface and click other icons to recover and view data of other category. 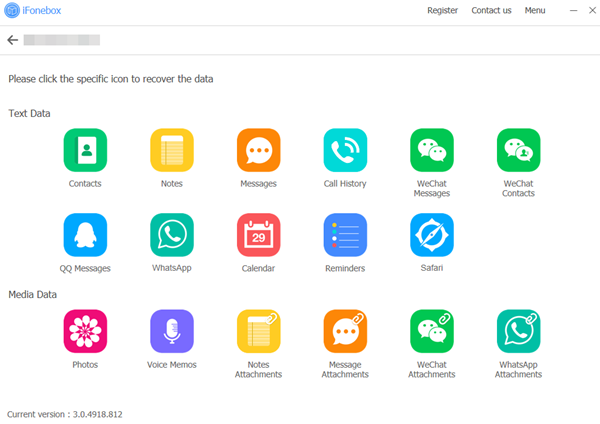 Notes: If you are recovering the Contacts, Notes and Messages, you can recover and transfer the exported contacts or notes or messages items to your device. iFonebox supports recovering data from iTunes backup file. If you have synced your iPhone, iPad or iPod Touch to iTunes and created iTunes backup file before you delete or lost some data from your iOS device, you can choose to recover and export lost data selectively from iTunes backup rather than restoring your iDevice with the entire iTunes backup. Install and start up iFonebox. Click to choose the recovery mode of “Recover from iTunes Backup”. A list of iTunes backup file will be listed on will be presented for your Selection. Please click to select one from which you want to recover your lost or deleted data. 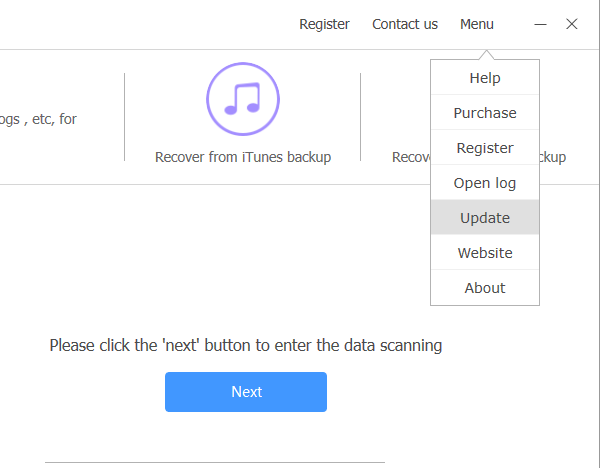 Tips: If the iTunes backup file of your device is not listed here, it is probably because you haven’t synced your device to iTunes on this computer you are currently running iFonebox. Click “Select more” to choose iTunes backup from other folder. 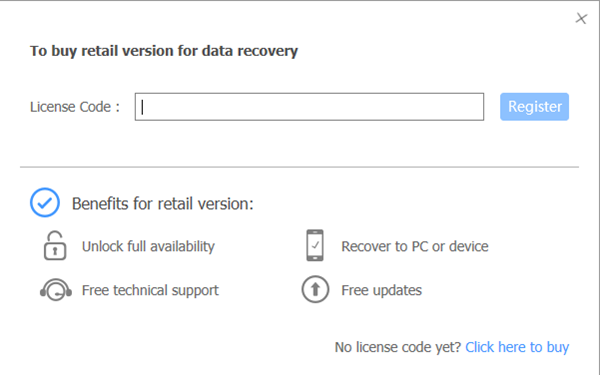 Choose the data you want to recover by clicking on the icon for the data. If you want to recover all the supported data, just click “Recover All” on the top right corner. It will take quite a time for iFonebox to scan and analyze the data from your iTunes backup file, please wait patiently. After the scanning process completes, please take a preview at all the exported data and select what you want to recover and transfer. iFonebox is capable of recovering and exporting data from iCloud backup. 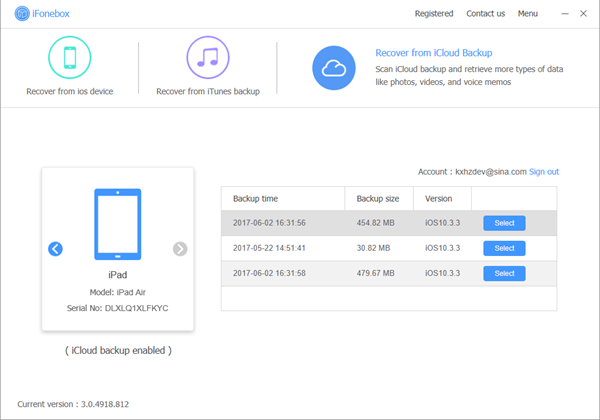 If you have ever backed up data on your iPhone to iCloud, it is possible to recover deleted or lost data from the iCloud backup you have previously created. Install the full version of iFonebox and start it up. 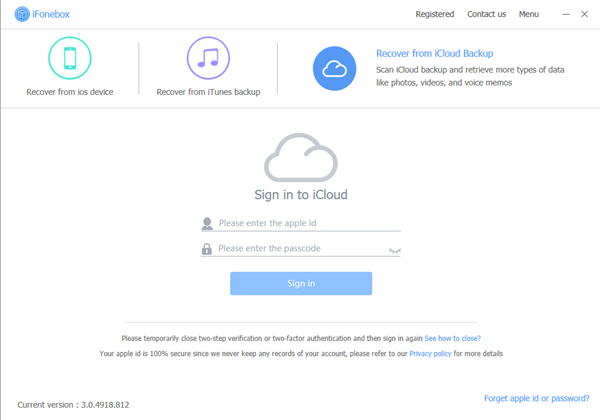 Choose the recovery mode of “Recover from iCloud Backup” from the startup interface. And then sign in with an Apple ID to iCloud as it is required. After you logged into iCloud, iFonebox will present you with all iCloud backup files within your account. 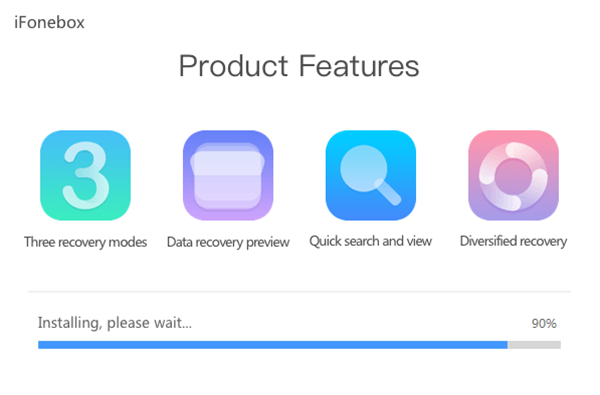 Choose the one from which you would like to recover data and click on the “Select” button. A window will pop up for you to choose the type of files you would like to download. This will save a lot of the time, for you don’t need to download everything from iCloud backup file. After finishing the downloading, you will be presented with the interface asking you choose data to recover. In this way, you can selectively recover whatever data as you need. It will take some time for iFonebox to scan and analyze the data, please wait for a while with patience. After the scanning process completes, take a preview at the exported data and select what you need to recover and transfer.